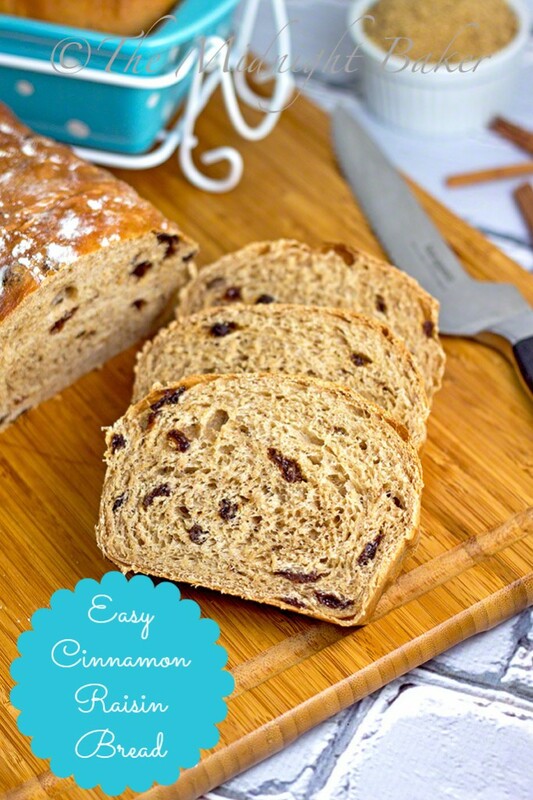 Easy-as-can-be cinnamon raisin bread that can be made conventionally or entirely in the bread machine. 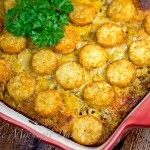 We’re giving away these gorgeous pans from Temp-Tations by Tara too! This is one of the easiest “specialty” breads I make. The original recipe came in the booklet that came with my very first Breadman bread machine. I’ve adapted it some, but it’s pretty much as I found it. 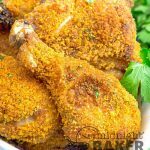 I use bread flour for one–but you don’t have to. All purpose will do just fine. You can also toss in some chopped walnuts or pecans. In fact, the original recipe calls for them, but as much as I like nuts, somehow, the thought doesn’t turn me on with this particular bread so I leave (and always have) them out. This is also a good toasting bread–if it lasts that long! I love it just out of the oven with nothing…not even a pat of butter…on it. I’ve given directions for the conventional and bread machine way. Either way you decide, it tastes the same! Even if the bread machine doesn’t deliver the desired shape–this is the now-infamous “Herman Munster’s shoe bread.” That name was coined by my friend Lori W. when I made a loaf for her and her family. Any other time I used the bread machine, it came out perfectly; except THIS time when I was making it for somebody (can you say “Murphy’s Law?”). It was sort of low on one end and high on the other and she said it looked like Herman Munster’s shoe. It did!! I only wish we’d gotten pictures of it and we still laugh about it years later! Here’s the deal–there is NO choice of color because this is what I have. You also have to be a US resident, over 18 years of age and live in the contiguous 48 states (no Alaska or Hawaii). I pack things very well, so there should be no problem with breakage–but since (you-know-what) can happen, I always insure the packages. By USPS regulations, it is the recipient who must claim on the insurance, so I can do nothing if it is broken. Of course if there is a problem with the dish itself after baking, washing, etc. (I washed it and found no cracks, pinholes, etc. ), the product is warrantied and all you have to do is call Temp-Tations customer service for a replacement. You also have to fulfill all required entries on the Rafflecopter app, which includes, but is not limited to: liking Facebook pages, following on other social media sites and commenting where appropriate. And of course the famous, “void where prohibited by law,” thingy. And I never understood that anyway, but I put it in to be safe. Add the oil, salt, dry milk, raisins, cinnamon and 2 cups of the flour to the bowl. Fit mixer with dough hook and using speed recommended by manufacturer (with KA that’s #2), mix the ingredients in the bowl. Add the remaining flour, 1 cup at a time, until a soft, but NOT sticky dough develops. If dough is a bit too sticky, add flour a tablespoon at a time. Flour is almost always a range–you only use as much as needed to get a soft, yet workable dough that doesn’t stick to your hands. Knead (by machine) about 5 minutes or turn out on floured surface and knead by hand about 8 minutes. Place about 1 tsp of oil in the bottom of a large bowl and place the kneaded dough in the bowl, coating the bottom of the dough with the oil. Turn dough oil side up and cover with greased plastic wrap. Let rise in a warm, draft-free place until double in bulk–about 1 hour. Punch down dough after the rise (yep, just give it a good clop in the middle of the dough to deflate it). Turn out on a floured surface and shape into a loaf–all this means is rolling or patting the dough out into a rectangle about 6×10 inches and rolling up, jelly-roll style from the narrower end. Seal the seams and place in a greased 9x5x3 loaf pan. Cover with greased plastic wrap and place in a warm draft-free place to rise until double in bulk; about 45 minutes. Heat oven to 350 degrees F. Bake bread for 30-40 minutes, or until it sounds hollow when you tap the bottom -OR- bread’s internal temp is 190 degrees F (if you have an insta-read thermometer). Remove from pans and cool completely on a rack. Place ingredients in bread machine in the order recommended by the manufacturer–this is usually all the wet ingredients first, ending up with the flour on top and the yeast on top of the flour. Set for SWEET cycle and just let the machine do it’s thing. 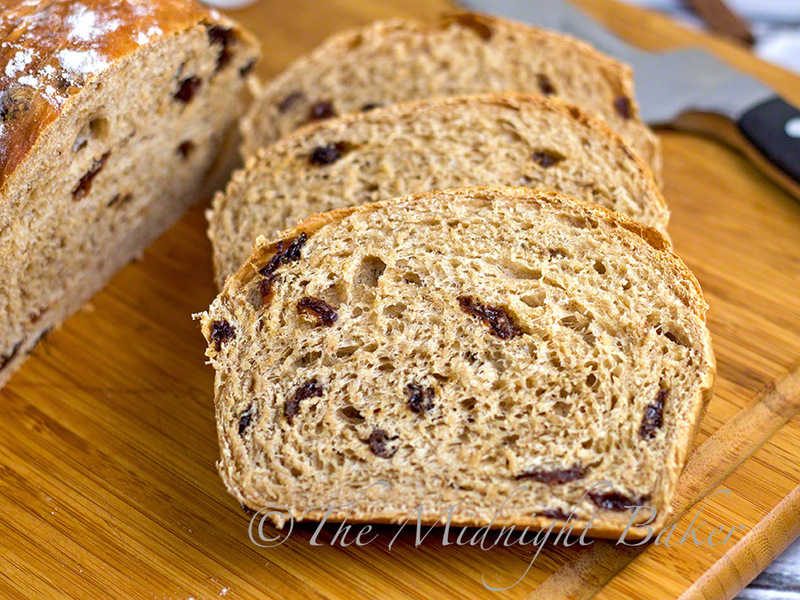 When I make this in my bread machine, I don’t bother waiting for the “beep” to add the raisins–I just throw them in at the beginning. These are such cute, springy colors. TT makes everything look so pretty! Fast becoming my favorite pans. I love these colors! I so want these pans! I love baking. This would be great with my TT collection! Thank you for the recipe. The pans are lovely. I need to make this! I think I'll put the dough in the bread machine and shoe and bake in loaf pans in the oven. Yummy! My neighbor loves this brand and always raves about them. I love the different designs. These are gorgeous. I love using my Temp-tations so much. When I was little, I played with my Barbie dolls. Now that I am grown up, I play with my Temp-tations! 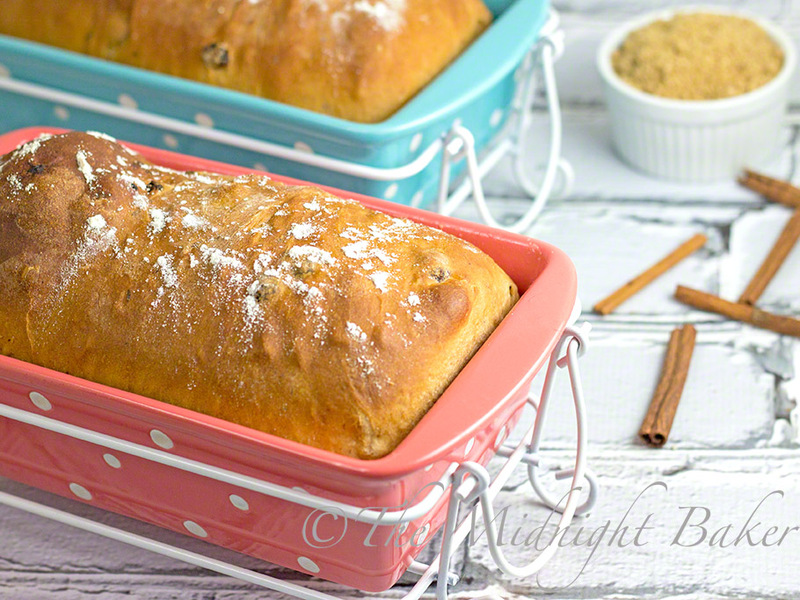 I love to cook & using such pretty bakeware always brings a smile to my face. 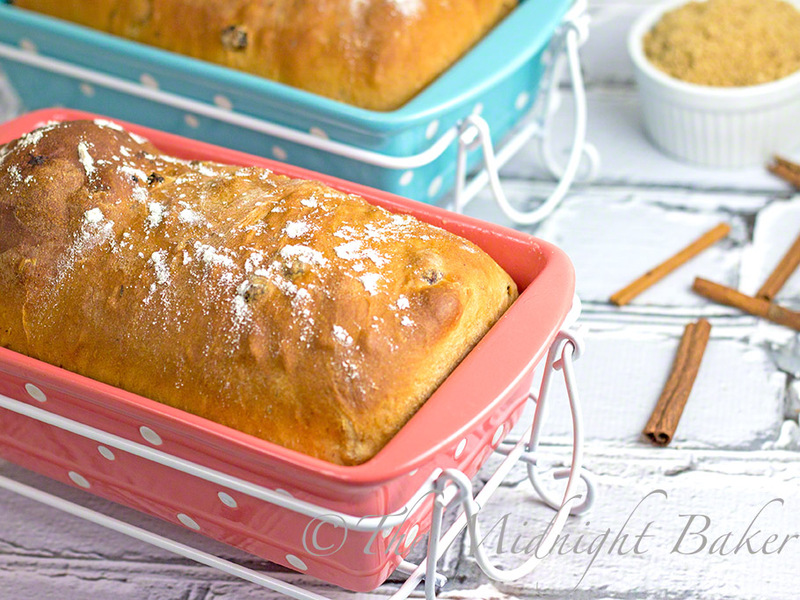 I tried this in my bread maker last night, for my bread maker it's a 2 loaf recipe, oh so good!! 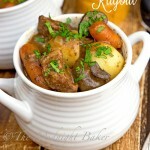 I'm getting ready to make it again, 1/2 the recipe. SO yummy! Now that is a great combination!! Bread Machine raisin bread and Temptations. Love both!! Love raisin bread and love Temptations. Those poka Dots are so cute. These are such bright, cheery colors! I would definitely be a happy baker!! I am so excited to try this bread recipe. I love baking bread This is my 26 year old daughter's favorite kind of bread. I am also going to make a loaf for myself too. Thank you so much! I love my blue old world collection. I get tons of compliments on them every time I use them. They are a dream to clean also! Recipe sounds wonderful. I'll have to try it but leave the raisins, we don't really like raisins in bread. lol Looks gorgeous in the TT pans. The ceramics are so cute. I've never heard of this company but I can see why you love them. They would definitely add some cheer to my baking. I like how they are designed. I haven't had the pleasure of using them yet. I love those! I have always wanted something like that!! I hope to win these. 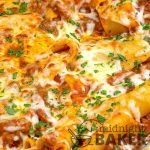 I love to bake and was looking for some good baking items to help. 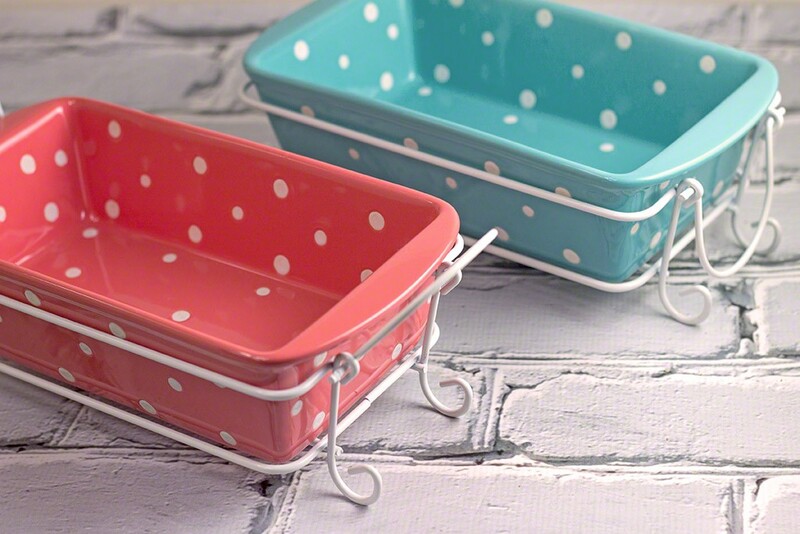 Anything baked in colorful pans would make anyones day. They are so full of color. 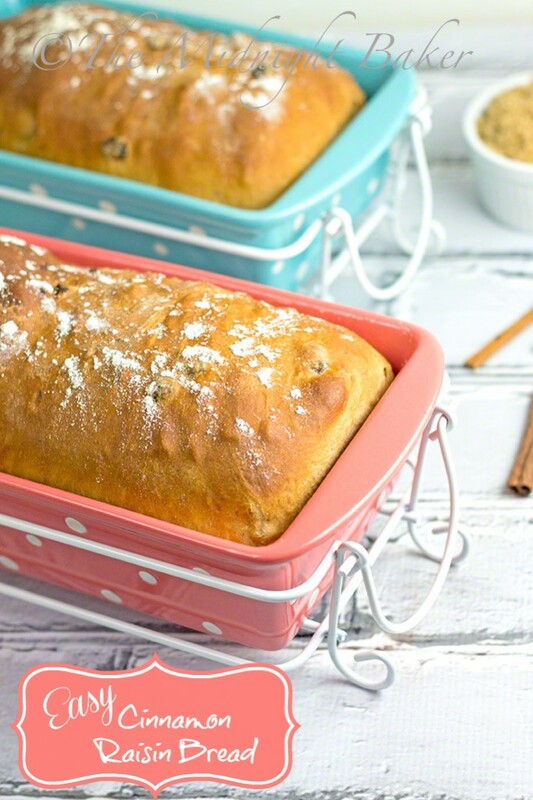 Plus, I love loaf pans like this. Making the bread right now….my daughter (27 next week) asked for it for her birthday present! I love my Temptations—Hello Yellow! My sister is the yellow lover LOL. I have some OW but am really a FL and PD fan mostly. Happy b/d to your daughter!! Her bread did turn out awesome!!!!!!!!!!!!!!!! Looks like both of us are in that bread baking frenzy gramma!!! <3 BTW, I can't decide whether I like this bread plain or toasted with a load of butter–so I always make 2 loaves for the "decision process" LOL!!! !